Frank received a BA from Meiji Gakuin University in 1905. 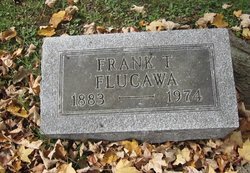 He was the owner and operator of Flucawa’s Flower Gardens on South Memorial Drive in New Castle (1942-1964). Frank lived in Tokyo, Japan (1883-1905); Indianapolis (1905-1919), Warren Park (1919-1936), and New Castle (1936-1974), Indiana. He became a naturalized citizen in June 1955. Learn more about Frank on his Find A Grave memorial. This entry was posted in Henry County, Marion County and tagged Flucawa, Osborne, Warbington on February 12, 2015 by oahblog. b. 1794, Virginia, to Jacob and Elizabeth (Michael) Daggy, Sr.
Anna, a farmer’s wife, came to Henry County, Indiana, prior to 1830. By 1850, they were living in Green Township, Howard County, but in 1856 they left Indiana for North English, Iowa County, Iowa, during the cholera epidemic. Anna and her sons lived close to each other while in Iowa. Around 1860 or 1861, while on the way back to Indiana, Anna died in Illinois before reaching the Hoosier state again. This entry was posted in Henry County, Marshall County and tagged Brown, Daggy, Goff, Harker, Khale, Lockridge, Michael, Small, Whitmore on September 22, 2014 by oahblog. Benjamin moved with his family in late 1856 or early 1857 to Iowa County, Iowa. Just after he turned 18, he enlisted in Company G, 8th Iowa Infantry Volunteers. His enlistment papers describe him as having hazel eyes, light hair, fair complexion, and standing five feet eight and a half inches tall. He was mustered out in Selma, Alabama, at the end of his enlistment on 24 January 1866. Benjamin returned to Iowa and lived there until his death. This entry was posted in Henry County and tagged Backus, Hall, Harvey, Knipfer, McKinstry, Molloy, Swope on September 22, 2014 by oahblog. Nora came to Indiana between 1866 and 1869. The family left the state sometime between 1903 and 1910. They lived in Springport, Prairie Township, Henry County; Cowan, Monroe Township, Delaware County; and Muncie, Delaware County. This entry was posted in Delaware County, Henry County and tagged Cassaday, Savage, Williams on September 21, 2014 by oahblog. The family was in Jefferson Township, Henry County, Indiana, by 1832 and left from there in 1856. William’s second wife Susan was Mrs. Brewer; she had five children. This entry was posted in Henry County and tagged Brewer, Burne, Garringer, Harvey, Louder, Lowder, Maitlen, Martland, McKinstry, Swope on September 21, 2014 by oahblog.